A survey conducted by research firm Creative Strategies last month has found that the iPhone X has a 97 percent customer satisfaction rate, primarily among early adopters of the smartphone in the United States, as noted by John Gruber. The total includes 85 percent of respondents who said they are "very satisfied" with the iPhone X, which Creative Strategies analyst Ben Bajarin said "is amongst the highest" he has ever seen "in all the customer satisfaction studies we have conducted across a range of technology products." 12 percent of respondents said they are "satisfied" with the iPhone X, while three percent were unsatisfied to various degrees. Of course, the higher the "very satisfied" responses, the better a product probably is. For perspective, research firm Wristly conducted a survey in 2015 that found the original Apple Watch also had a 97 percent overall customer satisfaction rate, but a lower 66 percent of respondents were "very satisfied." Apple CEO Tim Cook said the iPhone X has a 99 percent customer satisfaction rate on the company's first quarter earnings call, citing a study by 451 Research, but Creative Strategies said its own survey had a significantly higher number of respondents that led to a more balanced number with room for slight variance. Creative Strategies surveyed 1,746 respondents to be exact. The research firm informed MacRumors that respondents were profiled as early adopters based on a series of upfront questions about purchasing habits. 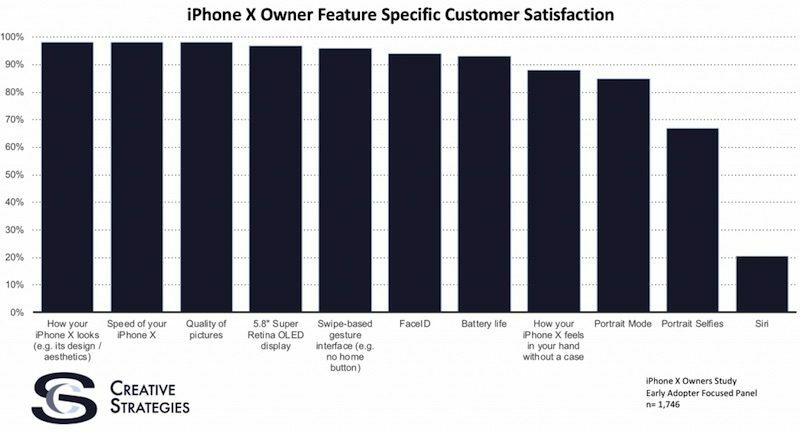 On a feature-by-feature basis, the iPhone X saw very high satisfaction rates in all but one area, including Face ID and battery life at above 90 percent. The sole exception was Siri, which scored only a 20 percent satisfaction rate among early adopters, leaving four out of every five respondents unimpressed. As noted by Creative Strategies, early adopters tend to be more critical than mainstream consumers of technology, but Apple is widely considered to have lost the lead it once had with Siri in the artificial intelligence space. The Information recently reported that Siri has become a "major problem" within Apple. The report opined that Siri remains "limited compared to the competition," including Amazon Alexa and Google Assistant, and added that the assistant is the main reason the HomePod has "underperformed" so far. Apple responded to that report with a statement noting Siri is "the world's most popular voice assistant" and touted "significant advances" to the assistant's performance, scalability, and reliability. "We have made significant advances in Siri performance, scalability and reliability and have applied the latest machine learning techniques to create a more natural voice and more proactive features," Apple wrote in its statement. "We continue to invest deeply in machine learning and artificial intelligence to continually improve the quality of answers Siri provides and the breadth of questions Siri can respond to." Bajarin has been a respected technology analyst at Creative Strategies since 2000. For more details from the survey, read Top Takeaways From Studying iPhone X Owners and his paywalled follow-up report iPhone X Study Follow Up on Tech.pinions. I use it every day. I use it for music, texting, alarms, timers, etc. I am a bad liar. Sorry Apple, most people don’t care about the jokes you add to Siri. To me, Siri has actually been getting worse. So frustrating even for simple commands. But... but.... MacRumors members insisted it'd be a failure at such a price and no one would buy it. In other news, the sky is blue! I think that Siri is due for an overhaul. I think we will see one by years end. And the notch of course! I don't use Siri for much, possibly because of it's limitations. but it works well enough for HomeKit and streaming music.